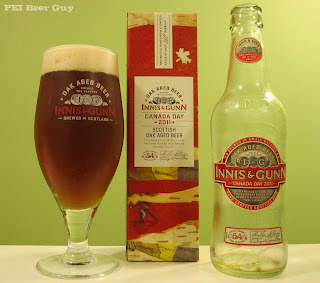 This Innis & Gunn offering pours a very clear, dark, reddish-copper. There is lots of head that lowers slowly, and leaves semi-solid lacing as it slides down with the beer. The fuggles hops add to the base I&G aromas here: there is some earthiness, woodiness, and some malt notes like toffee. The aromas are, overall, subtle, and it takes some deep inhales to get what you can out of it. The 8.3% alcohol content is hidden fairly well, but it does come out somewhat in the flavour. The bourbon oak barrels as well as the vanilla play their parts a little more subtly than in other I&G beers. What you'll taste are a bit of alcohol, wood, & vanilla. A fig-like flavour comes out in the aftertaste / finish, and there is also a slight spiciness present. Overall? Pretty good - could use a bit more balance & masking of the alcohol. This beer stays in the Innis & Gunn flavour range, but doesn't really shine or stand out from the pack.